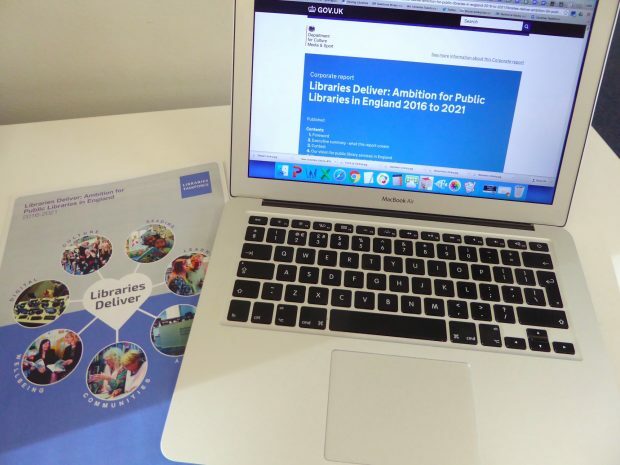 In my blog on 12 September, I explained that we were working away on our Libraries Deliver: Ambition for Public Libraries in England 2016-2021 document. So I’m pleased to tell you that we’ve published it today! Before I go into what it says, I just wanted to say thank you to everyone who took part in our Ambition consultation earlier in the year, particularly those who travelled to one of our workshops. It was inspiring to see and hear all the interest, passion and commitment for the public library network. The valuable ideas, insights and feedback we received really helped to challenge and hone our initial thinking, and make the document more useful to the various stakeholders we’re trying to involve as we take our plans forward. Why publish an Ambition document? We want to help decision-makers in central and local government understand how important libraries are to local communities, and the role that they can play in helping to achieve positive outcomes across a range of different social policy areas - for individuals, communities and society as a whole. And we’re hoping that the new funding and support programmes we’re announcing as part of our Ambition action plan will also help library services to better meet local community needs and become more resilient longer-term. We’ve also outlined specific ambitions for communities, public services and other partners, and library services. To achieve this, and to protect frontline library services in challenging times, requires radical thinking. That’s why this report challenges both central and local government to think and act differently to transform library services. Many councils are already working in new and different ways, but we need to go further. Usually these new ways of working will be locally-led, but we’ll also provide support through some national initiatives we’re taking forward. We’ve produced a short brochure setting out the key points in the document to stimulate councils’ thinking about the contribution libraries can make to achieving broader strategic objectives. It also encourages service commissioners to consider ‘libraries first’ whenever they need to deliver a service direct to communities. Alongside Ambition, DCMS have launched a new £4 million fund for libraries. This welcome investment will help library services pilot projects that provide people with opportunities that they might not have otherwise. Projects will need to tackle local needs and priorities, but could particularly support schemes in disadvantaged areas. Interested in making a bid? Arts Council England have published bidding guidance; and we’ll blog tomorrow to give you more information. Thinking about different ways to deliver your library service? A growing number of councils are using different models to deliver their library services. We want to ensure that they have robust evidence available to help them in their decision making. We have, therefore, commissioned research into the sustainability and effectiveness of community managed libraries which we’ll be using to improve our existing Community Libraries toolkit. We're also setting up a peer support network for community managed libraries - to support the sharing of good practice and development of sustainable business models. DCMS have also confirmed they will provide dedicated support for library services to explore and, where it is right for them, spin out into a public service mutual model. This support will build on the experience of trailblazing library services such as Suffolk, York, Devon, Nottinghamshire and Northamptonshire. We’ll be running masterclasses in the New Year so library services can learn more about the mutual models available and hear the experiences of those who have already gone down this route. If, after finding out more, library services want to take the next steps towards exploring these routes further, DCMS will provide tailored support depending on local needs. Our Libraries shaping the future toolkit provided information on different approaches to income generation, but we want to go beyond this. Therefore, with the Office for Civil Society and Innovation (OCSI), we’ll further explore how libraries can go about building new income streams, and share this learning and experience widely to support library services. As a first step, the Taskforce and OCSI will host masterclasses to help library services find out more about alternative funding models and to explore which will work in library services, as well as identifying areas for further action. Keep an eye out for more detailed blogs shortly, where we'll explain what we're doing on each of these and how you can find out more. We’ve published an Action plan, saying what the Taskforce will contribute to achieve our aims. But we can’t achieve everything on our own. So the Action plan also includes challenges to both central and local government. We’ll review progress regularly, and report back through our published 6 monthly progress reports (our latest progress report covers April to September 2016). We’ll be running workshops on Ambition and the accompanying action plan in January. We’ll blog later today with details on the agenda, dates, venues and how to book.